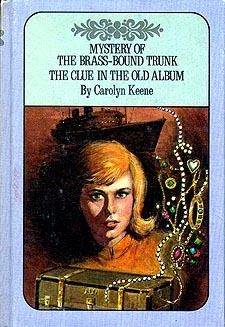 In the 1970's, the Twin Thriller book club editions were issued. These featured two volumes in one! They have lilac/gray colored boards with a design on the spine and solid color back cover. The only identifying mark on the back cover is a small number in the bottom right-hand corner. They were not described as being book club editions inside. 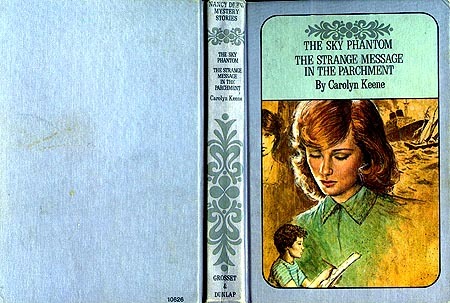 The artwork on the cover featured the current artwork for one of the titles in the double edition. 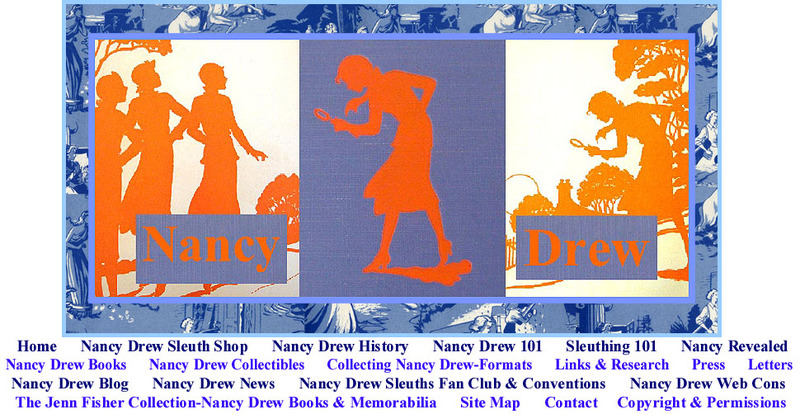 The exception to this is the artwork on the double edition of volumes 1 and 2 which was the specially created cover for the Nancy Drew Triple Edition. 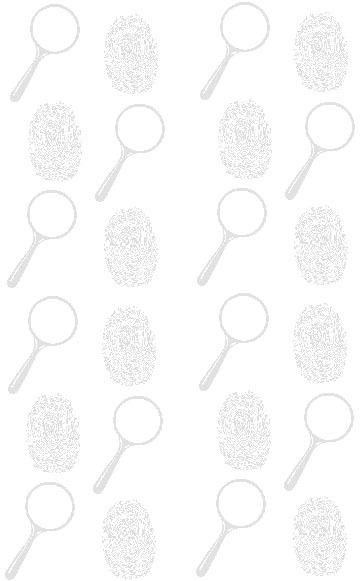 The only original text volume in this set is volume 13, The Mystery of the Ivory Charm. The Twin Thrillers were advertised in magazines and in mailouts. One advertising mailer had the young reader placing a mask on the return card to join the club. Of the classic series of volumes 1-56, only volumes 1-54 were issued in this set. Harder to find are the last few volumes such as 53 and 54 featured above and volumes 17 and 24 as these were issued last. Also hard to find are a taller size of the Twin Thrillers. 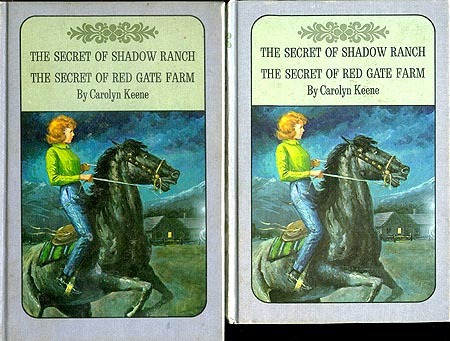 The Tall Twins were only issued for volumes 1-16. Shown below are the out of order volumes 17 and 24 and the size difference between a regular Twin Thriller and a Tall Twin. If anyone has any memorabilia from the book club editions such as advertisements, membership cards, etc., I would love to hear more about it. E-mail me here.